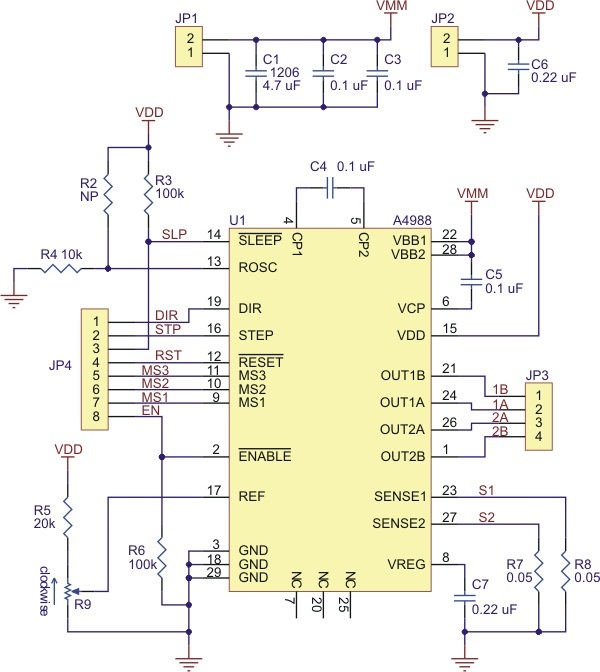 A4988 is a complete microstepping motor driver with built-in translator for easy operation. The product can be full, half, 1/4, 1/8 and 1/16 step mode to operate bipolar stepper motor output drive capacity of up to 35 V and ± 2 A. A4988 includes a fixed off-time current regulator, the regulator can slow or mixed decay mode. The converter is the key to the easy implementation of the A4988. In inputting one pulse on the STEP input drives the motor one microstep. No phase sequence tables, high frequency control lines, or complex interfaces to programming. A4988 interface is very suitable for complex microprocessor is unavailable or is overburdened. Micro-step operation, the chopping control in the A4988 automatically selects the current decay mode (Slow or Mixed). In the mixed decay mode, the device is initially set to fast decay in the part of the fixed off-time, then a slow decay in the rest of the downtime. Mixed-decay current control scheme results in reduced audible motor noise, increased step accuracy, and reduced power consumption. Internal synchronous rectification control circuitry to improve the pulse-width modulation (PWM) power consumption when operating. Internal circuit protection includes: thermal shutdown with hysteresis, undervoltage lockout (UVLO) and crossover current protection. Special power-Sort.